Ready for a game that's more satisfying than a mushmellon? We know what you're thinking. What on earth is a mushmellon. That's hillbilly slang for cantaloupe. You'll be hearing strange words you've never heard before a lot when you play Hillbillies Cashola, a fantastic online slots game at Slots of Vegas. But don't let the slang confuse you. With the kinds of rewards packed into Hillbillies Cashola, it'll all be worth it. 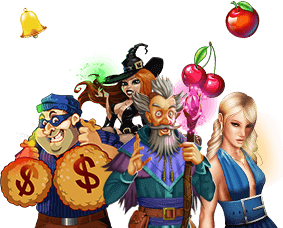 This 20-payline online slots game comes with all the fixins' including a top payout of 10,000x your bet per line, a progressive random jackpot that resets at $1,000 and pops randomly, and lots of bonus game opportunities. Ready to give Hillbillies Cashola a try? Get the free Slots of Vegas software now. We don't chew our cabbage twice, so hurry (look that one up). Playing Hillbillies Cashola couldn't be easier, even if you can't tell your "gol durn it" from your "dag nab it". This online slots game features 20 paylines. Start by making your line selections. It's a variable slots game, so you can play between one line and all 20. Then make your bet per line selection. You can bet between $0.01 and $5 per line, for a maximum of $100 per spin. When you're happy with your bet per spin amount, just click the Spin button to play. The reels will move and stop just a few seconds later. If you've lined up symbols, you'll win. You can check the value of the various game symbols at any time by clicking the Help icon. One of the smartest things you can do when playing Hillbillies Cashola is employ smart bankroll management strategies. Hillbillies Cashola is an extremely fun game to play, so thrilling that you'll want to play it over and over again. We recommend setting both time and betting limits. Never wager more than 5% of your bankroll per spin if you want to make your bankroll last. Obviously, your goal is to grow your bankroll, so risking too much at once could mean big gains, but it could also mean an instant loss. Bet small and you'll realize smaller wins, but more opportunity to win. Scatter: The Hillbillies are all scatter symbols. While most symbols pay out left to right, Hillbillies pay out in any direction, which means you don't have to worry about the order of your winning symbols. Substitute: In Hillbillies Cashola, the hillbillies are all substitute symbols too. They can sub in for all other symbols in the game to help you win money. Progressive Jackpot: If you love winning when you least expect to, you'll love the big Progressive Jackpot in Hillbillies Cashola. It climbs and climbs with each spin and resets at $1,000 when it pops.